Confortera did not disappoint. That is to say, they disappointed. 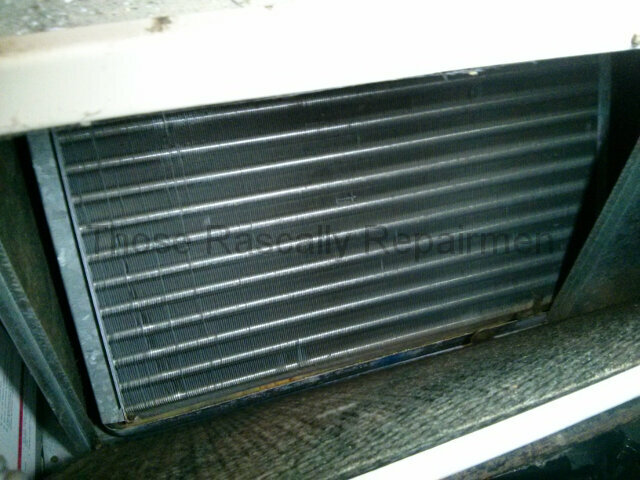 Their repairman strongly recommended a new furnace. 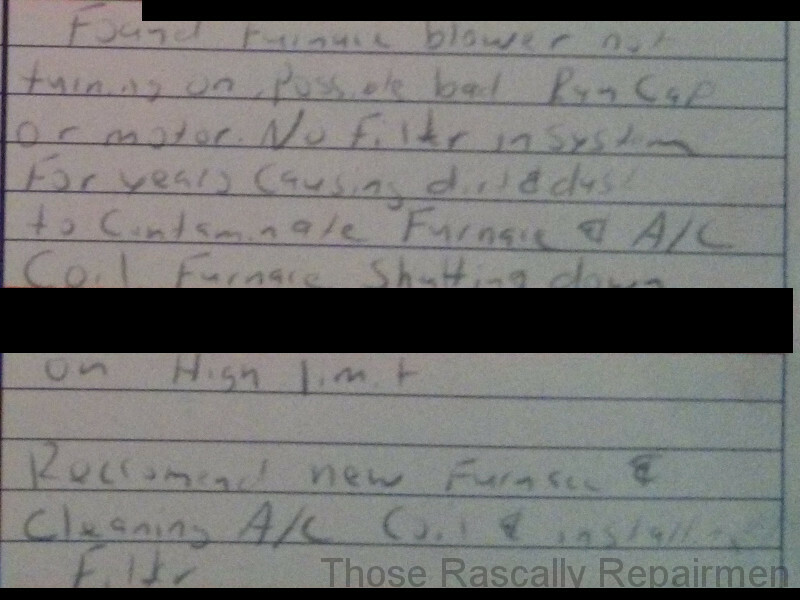 Of course a recommendation to install a new furnace is, in and of itself, not a problem. The furnace is 26 years old after all. The problem is in not knowing the problem. 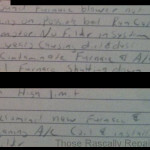 Their repairman charged $79 for a diagnosis that he didn’t bother to finish. 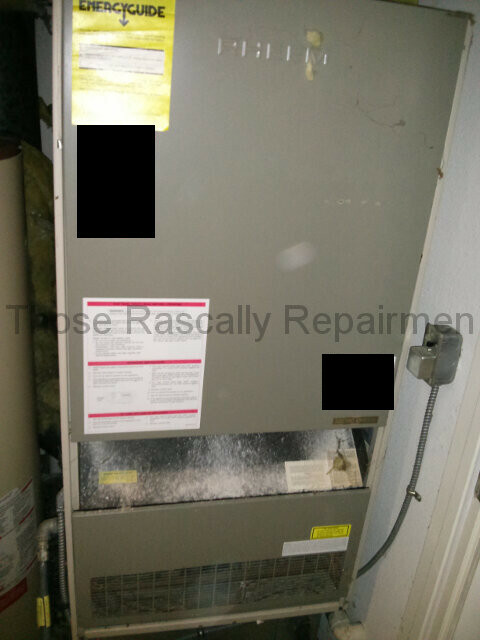 Per their invoice pictured below (click it to enlarge), the furnace has a “possible bad run cap or motor”. Okay…. which is it? If a repairman can’t figure that out, he doesn’t belong in this business. 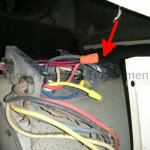 Of course Confortera’s repairman could have figured it out. He didn’t want to because, one, he’s probably on commission as most repairmen are. 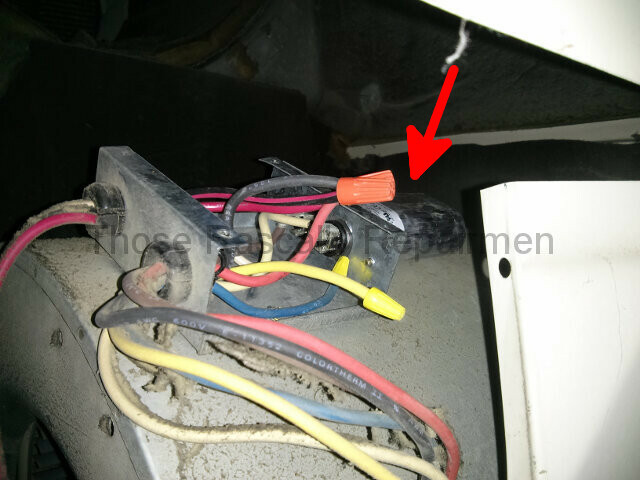 And two, the “cap” (capacitor – pictured below) was a little harder than normal to get at. It was so hard that I got my shirt dirty checking it out today. As it turns out, the capacitor was indeed the problem. 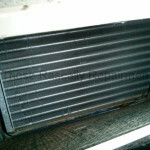 Their invoice also recommends “cleaning (the) A/C coil” pictured below. There were just two screws holding that coil’s cover in place. It took just two minutes to inspect that coil. Does that coil look dirty to you? Me neither, so I did not clean it. I did replace the capacitor and made other minor adjustments for two-hundred dollars out the door. The furnace is certainly getting old, but it runs fine for now.